NEW YORK—The UN General Assembly’s Third Committee (Social, Humanitarian and Cultural) passed a draft that would have the Assembly adopt the United Nations Declaration on the Rights of Peasants and Other People Working in Rural Areas. 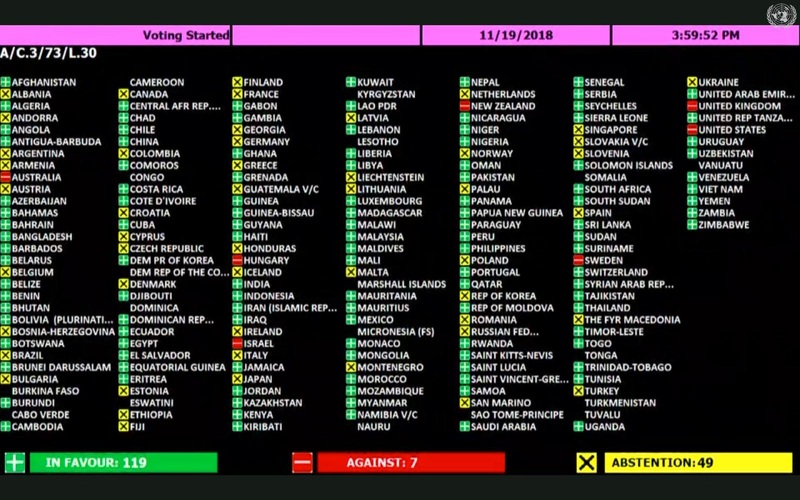 This vote assures that the Declaration will enter the next edition of Human Rights: A Compilation of International Instruments. The resolution A/C.3/73/L.30 passed by a recorded vote of 119 in favour to 7 against (Australia, Hungary, Israel, New Zealand, Sweden, United Kingdom, United States), with 49 abstentions, the draft generated debate over whether the declaration would create categories for individuals who merit special treatment in the international human rights framework. Several took issue with such references to collective rights and the right to seeds on which there is no international agreement. The resolution, tabled by Pakistan was adopted without a vote and cosponsored by 34 states. USA, Israel and Morocco were not among them. In addition, the Committee adopted resolution A/C.3/73/L. 29 reaffirming the inalienable right of self-determination of the Palestinian people, noting, in particular, the position of the International Court of Justice, reminding States that Palestinians’ the right to self-determination is a right erga omnes, meaning that all Member states of the UN—and even non-Member states—bear the legal obligation to ensure realization of that right, including the right to an independent state.